Checker is a board game played by two persons who alternate moves. The losing player is the one who has lost all his pieces or cannot move anymore because all of his/her checker pieces have been blocked. It is an interesting game for played in holiday or weekend with family member and friends. The checker equipment also simple and easy to save. You just need the checker pieces and checker board for play checker game. Standard checker pieces are flat and round and the checker board is a squares board as same as chess board. In the picture above is our giant checker set on its board. This is an absolutely beautiful giant checker and board that made of best Teak wood material. With inlaid checkers pieces on the top of board is certainly something special. 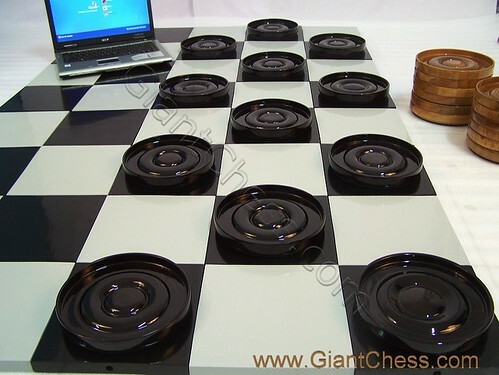 Different size of ordinary checker and board, this checker pieces is designed as giant checker and supported by its big board. The checker set is perfect for outdoor use.